Liberal Dan Radio June 27th, 2013: SCOTUS Recap, Jindal Veto and…. ENRON?!?!? Jeffrey Skilling, former Enron executive, was given a reduced sentence last week. You won’t believe why. A huge week for the Supreme Court this week. I will go into the issues of voting rights and marriage equality and point out the highs and lows of this week’s rulings. Also, I will be discussing the line item vetos that Louisiana Governor Jindal made to cut needed funding from Louisiana’s children with special needs. On the show I will have activists from the grassroots organization Override The Veto. Those issues, headlines, words of redneck wisdom, tweet of the week and more, this week on Liberal Dan Radio: Talk from the left, that’s right. And please remember the Liberal Dan Radio Kickstarter to help fund the show through the year. This Thursday on Liberal Dan radio I will be discussing the myriad of Supreme Court decisions made after the myriad decision. Many rulings were revealed on Monday. Of those I will at least discuss the ruling on voting rights in Arizona and on 5th amendment rights. At the time of this posting there has been no ruling on prop 8 or DOMA. However, by the time the show airs on Thursday, many are speculating that those rulings will come down as well. So obviously I will be discussing those cases as well. I will also talk about David Vitter and both his amendment to the farm bill and his Freudian slip about it. Finally, I will be updating everyone on the Liberal Dan Radio Kickstarter project that I created. Several new funding levels were started to give people a wider variety of options. So please, take advantage of it while it is still open for backers. All that plus Words of Redneck Wisdom, Tweet of the Week, Headlines and more on Liberal Dan Radio: Talk from the left, that’s right. After reviewing the headlines and going over some of the silliness that happened in Jefferson Parish last Saturday when it came to tolls and taxes, Liberal Dan Radio will actually start talking about the oral argumetns made in the Supreme Court about DOMA. That, plus the tweet of the week and words of redneck wisdom, on Liberal Dan Radio: Talk from the left, that’s right. Tonight on Liberal Dan Radio I continue the discussion of the Prop 8 arguments made in front of the supreme court. Today I will finish off the comments made by the petitioners, the challengers, and the Solicitor General of the United States. There will also be the snarky look at this week’s headlines, the tweet of the week, words of redneck wisdom, and an update from coolminiornot.com. All tonight on Liberal Dan Radio: Talk from the left, that’s right. Justice Scalia made some comments that seemed to defend the Prop 8 side on the harm that might come from allowing gay marriage to become legal in this country. He states that even though California does allow for couples with homosexual partners to adopt (and as such California does not believe that adoption by couples of homosexual partners is harmful to the children) that other states do believe it to be harmful and that it is something that should be considered in this deliberation over the topic on if equal marriage should be made legal nationwide because then you could absolutely have adoptions done by couples with homosexual partners. Now, Justice Scalia seems to have it backwards. He, and the proponents of prop 8, seem to argue that because there is no scientific data showing a lack of harm on children being raised by couples with homosexual partners that it means you should be able to ban gay marriage (since allowing gay marriage would allow those couples to adopt). As I discussed on Liberal Dan Radio this week, such logic is flawed. In order for government to have a rational basis to ban an activity it should have to prove the activity is harmful. Not the other way around. If government cannot prove the activity is harmful, it should be considered to have no rational basis to ban it. Liberal Dan Radio: March 28, 2013. I will go into several areas where some Conservatives just don’t understand what is going on. This will be the first of many shows where I go into the recent arguments made at the Supreme Court on the topic of marriage equality. There is a lot of audio so this topic will be split over several shows. But on this show I want to talk about some arguements made by Conservatives on this issue that show they are out of touch. I also want to talk about the topic of Dr. Ben Carson. He is a well respected and well awarded Doctor who made history. However, he is also a conservative and he happens to be black. Conservatives must think that this affords him a pass. And when they raise him up as a possible Presidential Candidate and liberals attack his stances, the liberals are called racist. But who are the real racists here (if any)? 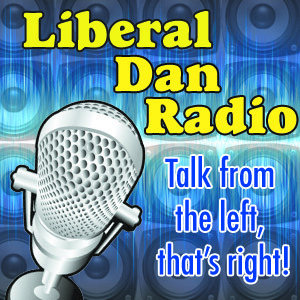 Those topics, headlines, and more, tonight on Liberal Dan Radio: Talk from the left, that’s right! Clotters, the new conspiracy theory. On the latest episode of Liberal Dan Radio, towards he end of the show I spoke about some random issues. One of them was the latest conspiracy theory by the extreme right that Hillary Clinton faked her blood clot in order to avoid Senate hearings. The name of this group, like birthers, shall be clotters. Also on the show I discuss the fiscal cliff negotiations, the death of the GOP (and why it wont just die swiftly) and how a sperm donor case in Kansas is an argument on why we need marriage equality. So listen to Liberal Dan Radio: Talk from the left, that’s right. Yesterday the Supreme Court rejected an appeal by a few birthers after the 9th circuit court of appeals ruled against them. There are many reasons to reject these crazy birther cases. You have all the instances where birthers have presented fake documents in order to try and discredit President Obama. You have the fact that the onus is on those bringing the case to prove they are right and they have no such proof to do so. You have the existing documents on record proving Obama’s birth in Hawaii (which makes him a natural born citizen because he is a citizen by the nature of his birth). But what did the 9th circuit hang its ruling on? They ruled that the birthers lacked standing to bring the case. They couldn’t prove that they would suffer harm from the Obama presidency. Now, I do have a problem with that logic. Every single citizen of the USA, at least of voting age, should have legal standing to question the qualifications of the President. Let me be clear, when they do so they need to be able to present some proof to show that their case is valid. It is not enough to say “I don’t believe it because I havn’t seen the hard copy version of his birth certificate”. But if someone were to ever have actual proof of something against any President, that person should be able to have standing to present it. The other case is the recent ruling against DOMA. DOMA should be ruled unconstitutional. If a couple is married in a state that allows marriage for all and cannot receive the federal benefits that other married couples can get, it should be ruled to be a violation of the equal protection clause of the Constitution. But the court didn’t go that route. The court said it interfered with the right of a state to define marriage as it sees fit. I have three big problems with that. First of all, states do not have rights. States have powers, people have rights. Second of all, states should not have the power to define marriage if that definition violates any part of the Constitution. This ruling basically affirms the ability of a state to discriminate when it comes to marriage. Finally, as I said before, the equal protection clause should be all that is needed here. So while it is good that the birther case got thrown out and it is good that DOMA lost again in court, I worry that the way they went down will ultimately be problematic.